In the summer of 2008, I had a master plan. I wanted to take a month off work to travel and do international volunteer work. I proposed it to my manager - I had 3 weeks of paid vacation and would take another week unpaid. His response? Check with my co-workers since they would cover my work while I was away. They gave me the go ahead and I never looked back. 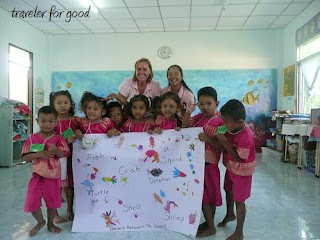 I chose to volunteer with Cross Cultural Solutions for three weeks in southern Thailand and I had some time for travel before, after, and on the weekends. If you want more information, click the Traveler Abroad page above and scroll down to Thailand 2009. Part of loving Thailand is loving the food. I ate non-stop for a month and came home 7 pounds lighter. I'm going to say it was the heat, combined with eating a lot of fresh fruits and vegetables and very limited processed food (although garlic soft-shell crab potato chips are pretty good). When I came back from Thailand, I gave the H-Mart, the "big box" Asian grocery store here, a more thorough exploration. The pricing on fruits, vegetables and spices is very reasonable. You can find a bunch of fresh basil or mint for 50 cents. 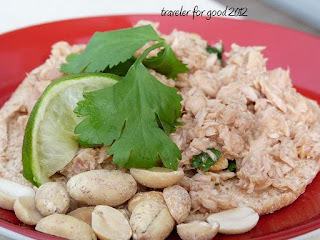 I have a fantastic Thai cookbook, Quick And Easy Thai, by Nancie McDermott - and adapted today's lunch from that cookbook: Spicy Tuna Salad with Chilies and Lime. Next time, I'll have to make a bigger batch. Combine all ingredients in a medium bowl. Mix gently to season the tuna and break it into smaller chunks. Cover and chill until ready to serve (then garnish with cilantro, lime wedges and more peanuts if you'd like). I enjoyed mine on an Orowheat Whole Wheat Sandwich Thin. 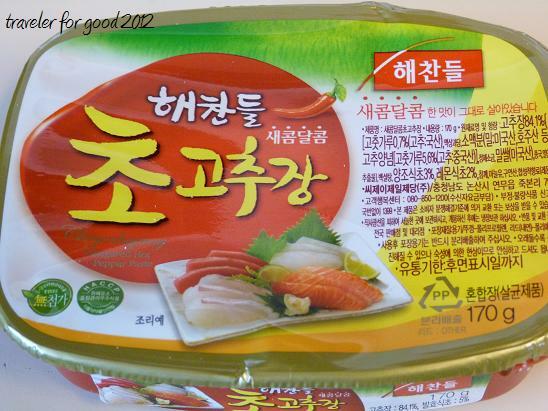 Chili Paste from the H-Mart - the label is all in Korean. Thankfully, the prices on the shelves had a little English.